Ten former Little & Often Mercedes-Benz Sprinter minibuses have been transferred to Stagecoach North Scotland’s fleet, destined for use on scheduled bus services in Aberdeenshire, Moray, Caithness, Orkney and Skye. This news follows the May announcement that the Sprinters would be dropped from the Ashford, Kent Little & Often service in favour of 17 Optare Solos. Newly-repainted into Stagecoach livery, each 66-plate Sprinter comes equipped with faux leather seats, seatbelts, contactless ticket machines and a Euro VI-compliant powerplant. Plus, the minibuses feature tracking equipment, which allows customers to pinpoint exactly where their bus is while they’re waiting at a stop. The minibuses will appear in service this month in Peterhead on services 81, 82, 83 and 84A/C. Meanwhile, one minibus will be used in Moray on service 31, whilst three minibuses will be introduced on services 74/274, 76 and 78 in Caithness. Orkney is also set to receive one of the vehicles, which is planned to be used on a school bus route and on other daytime work. A further vehicle will head to the Isle of Skye, running on route 55, while the remaining vehicle will be used on a school bus service in the Banchory area, operating on behalf of Aberdeenshire Council. 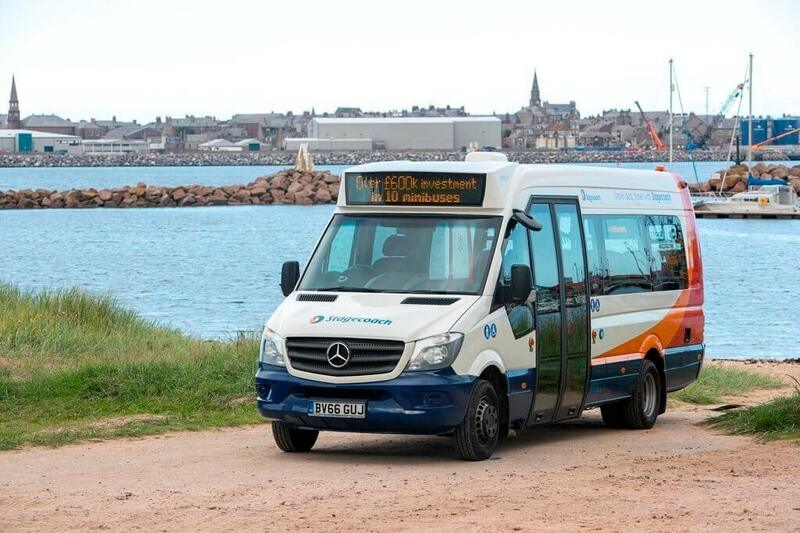 David Liston, Managing Director for Stagecoach North Scotland, commented: “We are delighted to introduce the Mercedes-Benz minibuses to our fleet for the first time. “We have received feedback from the local communities that modern, smaller buses would be their preference for some of the shorter trips we operate. “Low-floor access, including a dedicated space for wheelchair users, will improve the attractiveness of local services in many of our communities, especially for customers travelling with shopping as well as those with reduced mobility.